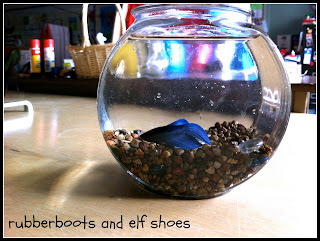 We have a pet fish in the classroom. He has an extraordinary talent. Every night, after everyone goes home. 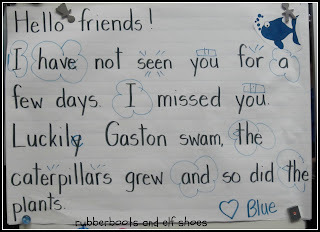 Blue somehow wraps his fins around a marker, and writes a letter to the kidlets. As I said, a very talented fish. 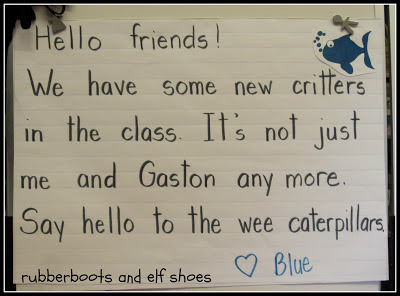 We read Blue's letter together everyday, looking for popcorn words, word chunks, alien words (that do not follow earth rules), and being excellent readers. 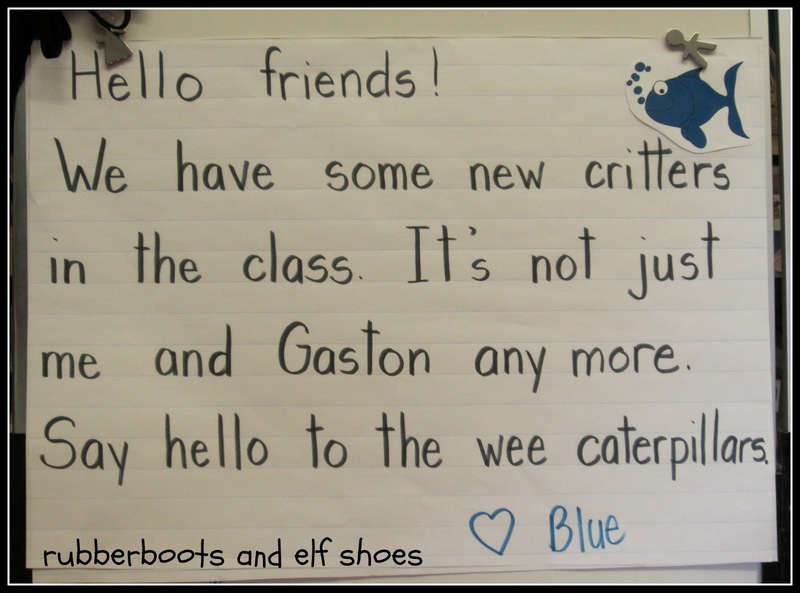 After a few weeks of writing letters to the kidlets, Blue felt that things were not really fair. He was writing a letter every night. And you know, it can't be easy to write with only fins! And he never got a letter back. He was fairly blunt with the kidlets. He made it quite clear that he expected a letter every day. Fair is fair. The kidlets thought that Blue's request was quite reasonable. The daily helper gets to choose what to say to Blue. Everyone in the class helps stretch words to hear the sounds, and then tell me what letters to print. Some kidlets know where in the class to find words that we need for our letter. Others have the spelling of words "parked in their brains". We all chip in, because that's what Blue wants. He's that sort of a fish. Aannnnnnd now I know how to frame my morning message next year. Perfection! 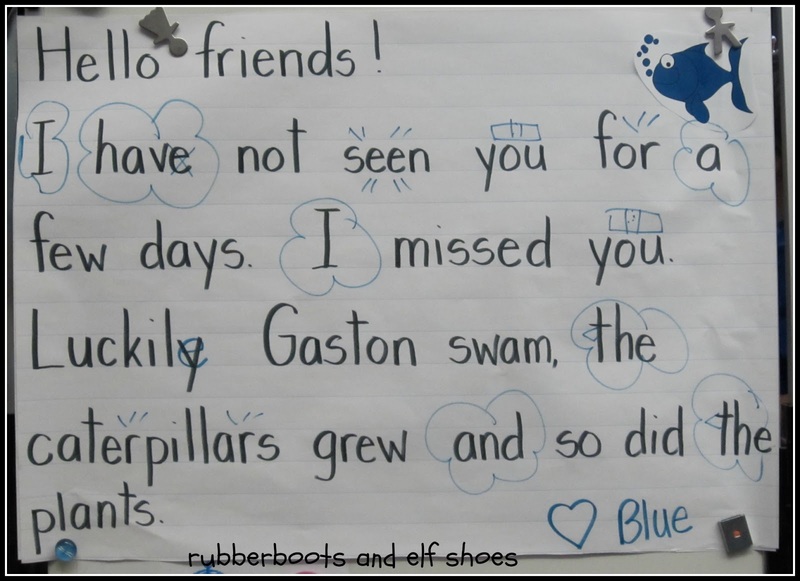 It's a lot more fun to channel a fish than to write a morning message every day. Cute idea! The kids must be thrilled getting to write back! We carry on a conversation with a fish. It keeps us all amused! Love it! Who can blame him, poor fish, I'd expect a letter back everyday too. I'm gonna need to borrow the alien word reference, it hits the nail right on the head for me. Alien words work - the kids get it. Words that don't follow earth rules. A talented fish is a good thing to have in the classroom. Love it! I would give my right arm to teach K next year and be doing this stuff along with you. You are the best. I would LOVE to work with you. We would have so much fun! Sometimes our district lets us visit other classes (they pay for our sub). If we have that opportunity next year, can I come and visit you? If you buy a Blue - make sure that he is a standard looking (no distinctive marks) beta fish. You never know when you have to make a quick trip to the pet store to purchase a replacement Blue! My door is always open, and you are always welcome.